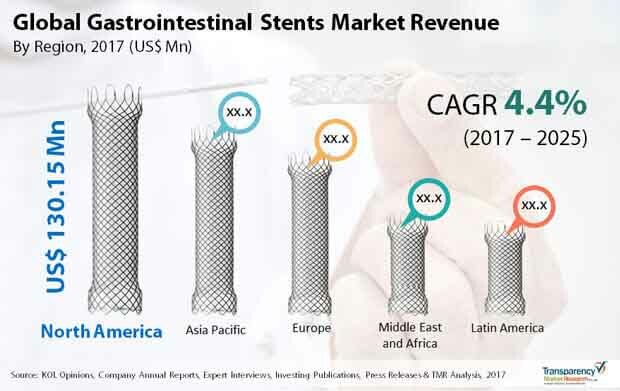 The global gastrointestinal stents market is projected to accelerate in the years to come owing to the presence of a handful of players as per the Transparency Market Research (TMR) report. There are a few dominant players in the market who hold substantial portion of the market for gastrointestinal stents globally. These few companies continue to maintain their strong foothold and give tough competition to each other in order to stay ahead in the game. The major players of the global gastrointestinal stents market are Olympus Corporation, Boston Scientific Corporation, Taewoong Medical Co. Ltd., Dickinson and Company, Merit Medical Systems Inc., and CONMED Corporation. Players are putting more emphasis on merger and acquisition strategies in order to gain technical expertise and continue to grow in the market. Apart from that, players are also trying to develop differentiator products so that they can stand out amongst other vendors in the market. As per the TMR reports, the global market for gastrointestinal stents is estimated to reach a value of US$522.8 mn by the end of 2025. The forecast period is set to 2017 to 2025 and the CAGR is seen to be at 4.4%. On the basis of end-user, the market is seen to be dominated by the hospitals segment with an account of more than 71.5% in the overall market. This is due to the fact that hospitals are preferred most of the time for any minimally invasive surgery for gastrointestinal diseases. From a geographical point of view, the global market for gastrointestinal stents is projected to be led by North America. Owing to the increasing number of population who get diagnosed with gastrointestinal diseases, especially in the U.S., the market in North America is projected to account for almost 94.0% of the global share. The market for gastrointestinal stents is boosted by a number of factors, one of them being, the rise in the number of gastrointestinal disorders and diseases. The main reason for gastrointestinal problems is the irregular and improper food habits. Following the trend of ready-to-eat food type and easy cook food products, people are becoming lazier and do not usually take note of what they consume. This, in the long run leads to digestive problems, malfunction of the kidney and so on. The lethargic lifestyle of people is leading to the increase in demand for endoscopic stenting, as it serves as an alternative to repetitive endoscopic procedures and surgeries. The demand for gastrointestinal stents is on the rise mostly in the developing nations due to increase in gastrointestinal problems. Apart from that, the high effectiveness of gastrointestinal stenting procedures is fuelling the market for gastrointestinal stents. The cost of gastrointestinal stenting is lower as compared to the usual palliative surgeries and thus, more affordable for people with poor outcomes. This, in turn is also accelerating the market for gastrointestinal stents in the coming years. There is also an increase in the number of minimally invasive therapies as a result of substantially increasing digestive tract diseases. In cases where curative surgery is not practically possible, the gastrointestinal stents are being preferred as palliative therapeutic modality, thus adding a boost to the market. The market has seen rapid advancement in terms of performance and design of gastrointestinal stents that is used. Mortality and morbidity rates have been lowered worldwide as a result of stent efficiency and improved stent procedures in the recent years. This has led to lower mortality rates and is thus projected as a positive factor in the growth of the gastrointestinal stents market in the long run. In cases where there is a possibility of infection, it may be difficult to decide whether the gastrointestinal stent procedure will be the most apt option. Clinicians are insufficiently focusing on tumor related problems and other oncological safety and this may act as a hindrance to the overall outcome of gastrointestinal stents in the market. However, players are focusing on improvising the design of the stents so as to produce less complicated end products, thus, giving more scope for growth of the gastrointestinal stents in the years to come. The review presented above is based on a TMR report, titled, “Gastrointestinal Stents Market (Product Type - Esophageal Stents, Duodenal Stents, Colonic Stents, and Biliary/Pancreatic Stents; Stent Type - Metal Stents, Plastic Stents, and Biodegradable/Drug Eluting Stents; Application - Gastrointestinal Obstructions, Colorectal Cancer, and Inflammatory Bowel Disease; End User - Hospitals, Specialty Clinics, and Ambulatory Surgical Centers) - Global Industry Analysis, Size, Share, Growth, Trends, & Forecast 2017 – 2025”.